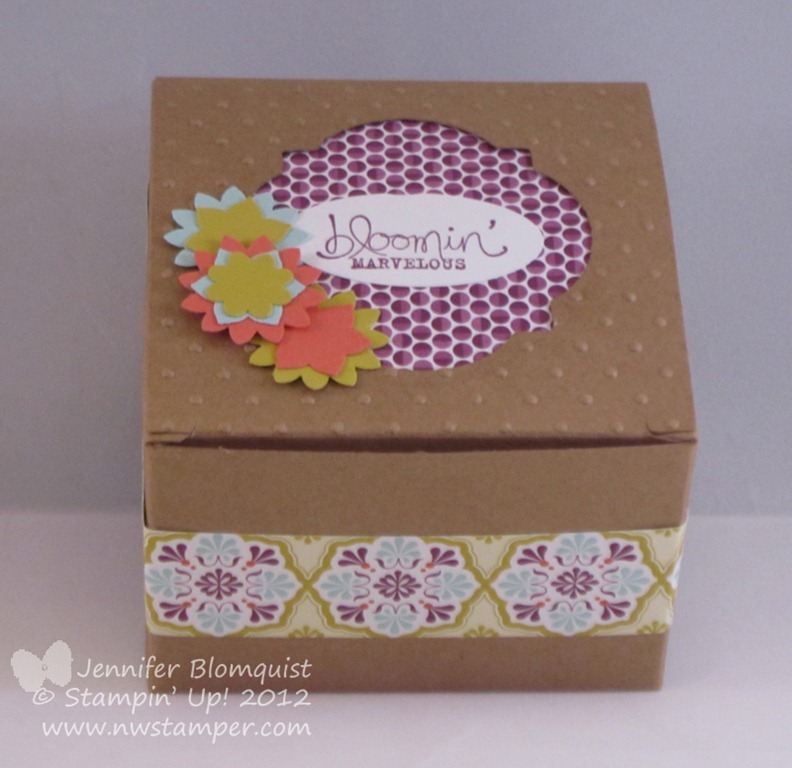 New Stamping Basics Online Class from Stampin’ Up! 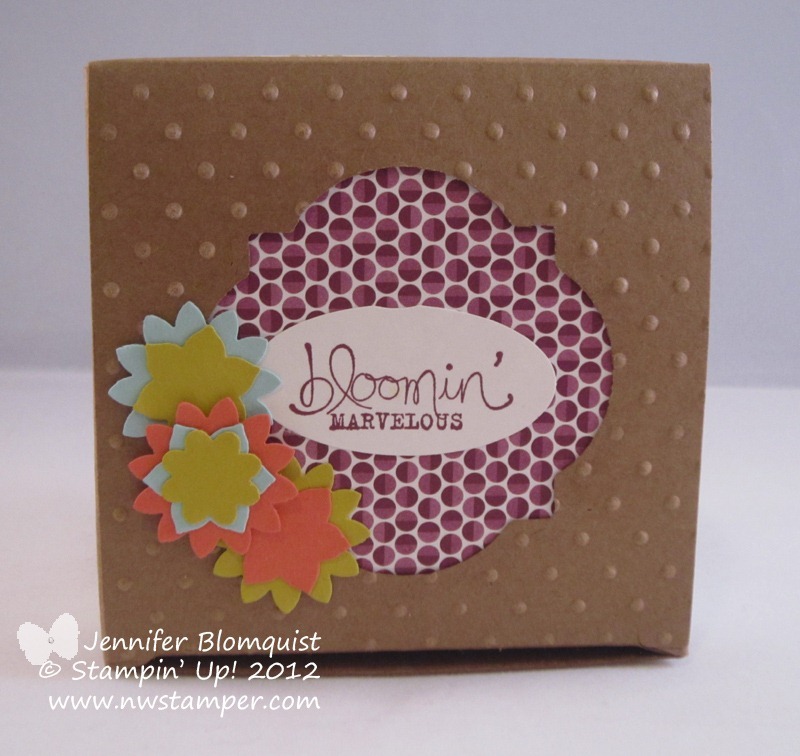 So, if you haven’t heard, yesterday Stampin’ Up! 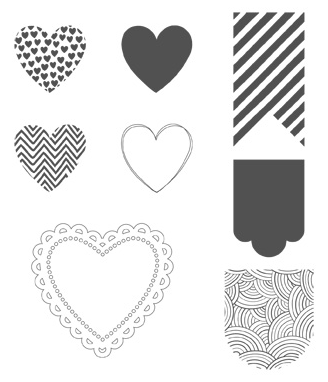 released an online class called The Basics which is a class to help show you how to use your crafting and stamping tools to make some cute projects- over 30 projects in fact! Each section has downloadable PDF instruction sheets and supply lists so you can follow along at your own pace and have the information to use later. The class is only $14.95 for all 30+ project instructions and videos and you can download it right away! 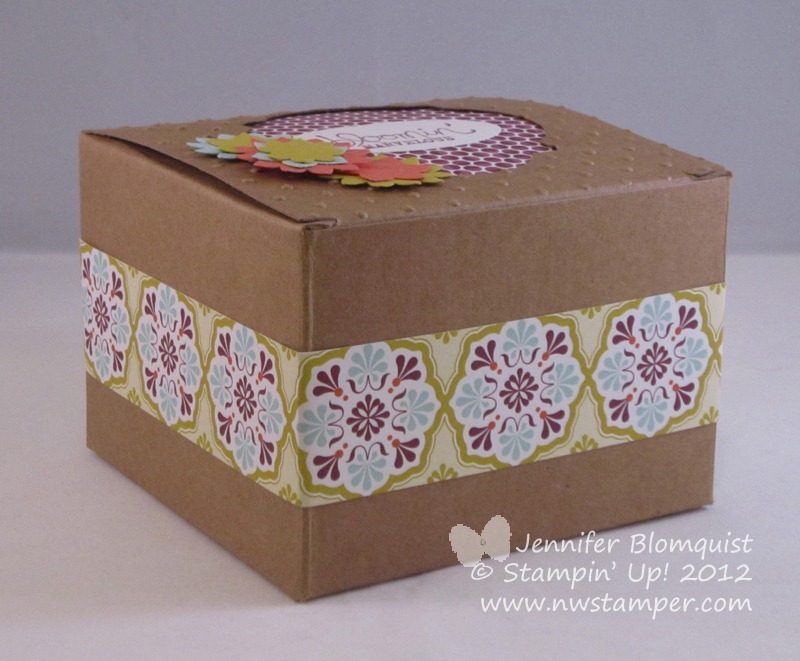 Get your copy of this Stamping Basics online class here! So, enjoy and let me know what you think! Ever since I went to Leadership in January, I have been dying to try out the technique of smashing the soda pop tops with your Big Shot to create these super cute embellishments. For some reason I thought it was going to be super hard or complicated… or something that made me a little bit intimidated to give it a try. But then one day I decided to just go for it and I was shocked at how easy it was! I just had to use some of my new favorites including Tea for Two designer paper and the Honeycomb embossing folder for the base of the card. But check out this pop top… isn’t is awesome when smashed?!? That’s it! It smashes fast and like buttah! I have way too much fun doing this. I just used the 1” Circle Punch after I stamped my image from the Collage Curious stamp set (stamped on River Rock cardstock) and adhered it to the inside of the pop top. Then I filled the inside with Crystal Effects. I will warn you it takes a long time to dry! Like seriously, it took probably about 45 min for mine to dry because I used soooo much Crystal Effects. But it looks so awesome that I just had to do it. So if you haven’t tried this smashed soda pop top technique yet, you totally should! Give it a try and let me know what you think. When I accidentally ordered 3 packs of the Kraft Treat Boxes because I thought you were getting one for the $2.95 not 4 boxes for the $2.95, I was initially bummed to have so many boxes; but now I’m almost out and have been loving experimenting with them! This was my first time trying out embossing and die cutting the boxes but I just LOVE how it turned out. What do you think? I started out by grabbing my Window Frames framelits and cutting a hole in the top flap. I will admit, it took some playing with which tabs to use and how to fold the box so that it would fit through the Big Shot. In the end, I think I flipped over the first tab so only one tab on the white Multi-purpose Platform was being used. 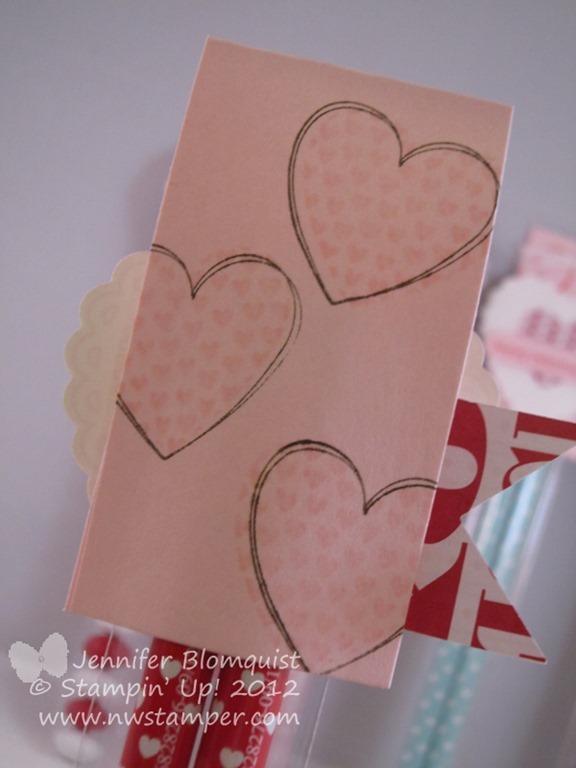 Once I got it cut out, then I went back with my polka dot embossing folder and embossed just the top flap. Again, it look a little manipulation and I think an extra tab on the platform being flipped out, but it eventually worked! Then I just glued a piece of the Sycamore Street designer paper that I got free as part of the Sale-a-Bration promotion behind the hole for a pop of color. I punched out the sentiment from the Bloomin’ Marvelous Sale-a-Bration stamp set and then added some flowers I created using the Boho Blossom punch. Finally I finished it off with a band of the Sycamore Street designer paper (in one of the other patterns) to tie in the colors from the top to the side of the box. Now it is the perfect gift to fill with treats and give to the next person who hosts a private class with me! I still have a couple dates left for the Sale-a-Bration promotion period, so contact me at jennifer@nwstamper.com if you want to have a fun night out crafting with some of your friends. I bring the projects, you all just show up and have a great time! Just when I was sad that we didn’t get any snow in Seattle this year, I learned the day before our trip to Kansas that a winter storm was due shortly after we arrived in town. And we got in, went to bed, and woke up to tons of snow! While Caitlin wasn’t too sure about it (when the snow is above your knees, it’s kind of hard to get around! ); Nicholas loved stomping around! So, we’ve been a bit busy watching and playing in the snow and visiting family this week. For all of you in the Midwest being affected by this storm, I hope you are all safe and staying nice and warm! And if you are on the coasts…. well, I’ll throw a snowball on your behalf. In the meantime, I thought I’d share a bright and cheery card I received at a swap at Leadership. 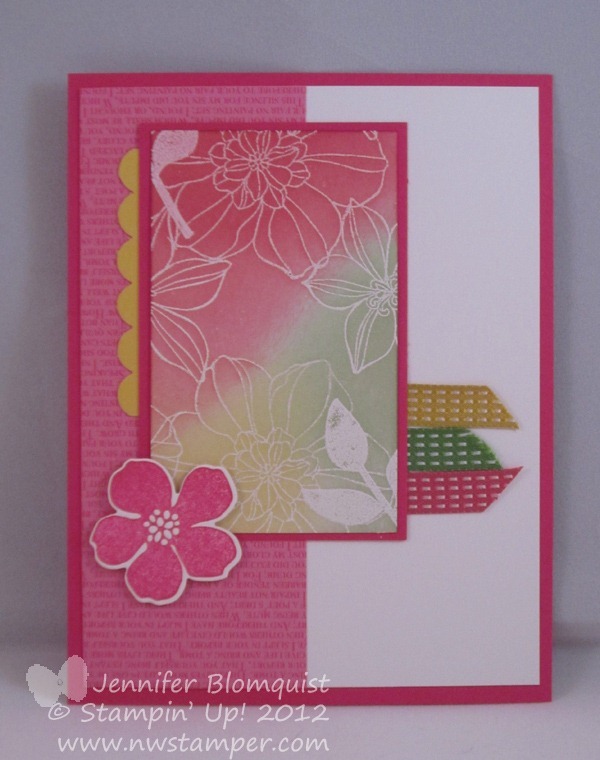 I love how Kim mixed and matched the bright colors and did the super pretty emboss-resist technique with the Secret Garden stamp set! So, enjoy! And I’ll be back tomorrow with a fun treat box idea for you! 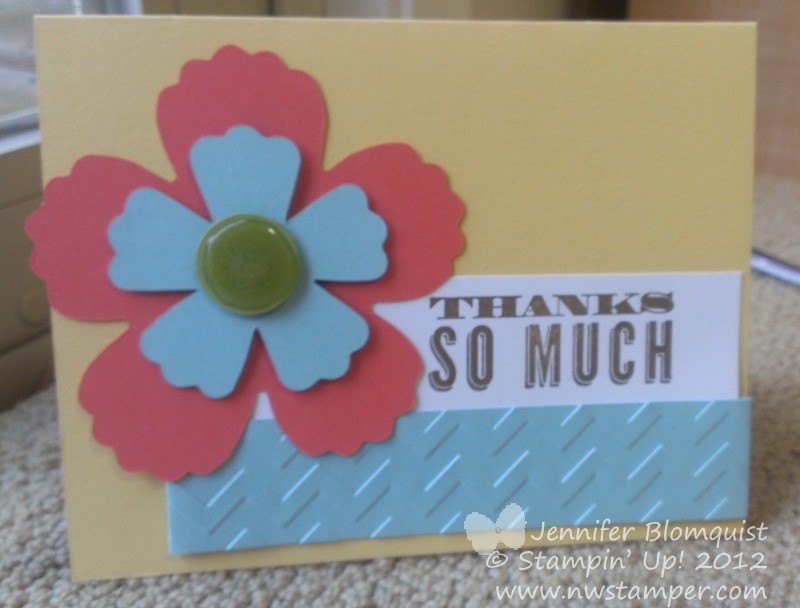 Anyway, I LOVED how the colors went together so awesomely using the Fun Flower Big Shot die. 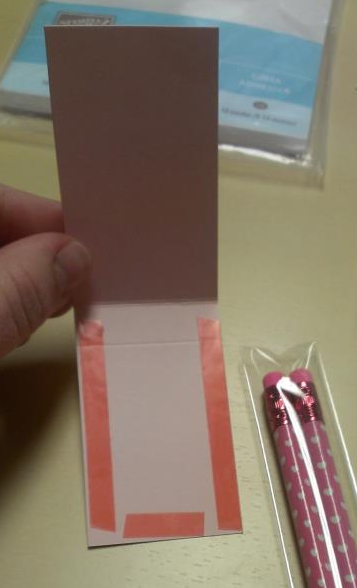 So, I put together a box for my hostess – only I did a bigger box so it would fit the cards she was making at her event. Of course I totally forgot to take a picture, oops! It was quick to put together and a great way to use up some scraps. I just ran a scrap of Pool Party cardstock through my Big Shot with the Chevron Embossing Folder to accent the sentiment (the Thanks from Oh Hello stamp set). Then for a final touch, I added Crystal Effects to the center circle of my flower for a bit of shine and dimension for the flower. Hmm, seeing this card again is making me want to make more. 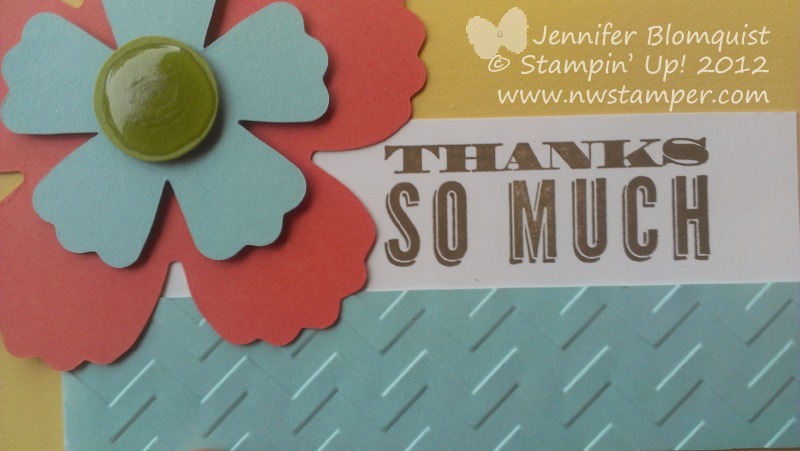 Maybe this will have to be my next set of Thank You cards for my amazing friends and customers. Ooooh… and change out the sentiment to the “Oh Hello” sentiment and send it out to people who need random sunshine in their day. Ok, guess my Big Shot and I have a date with some In Color cardstock! So, while I go off and do that I hope you have a bright and sunny rest of your day! Look, it’s back! 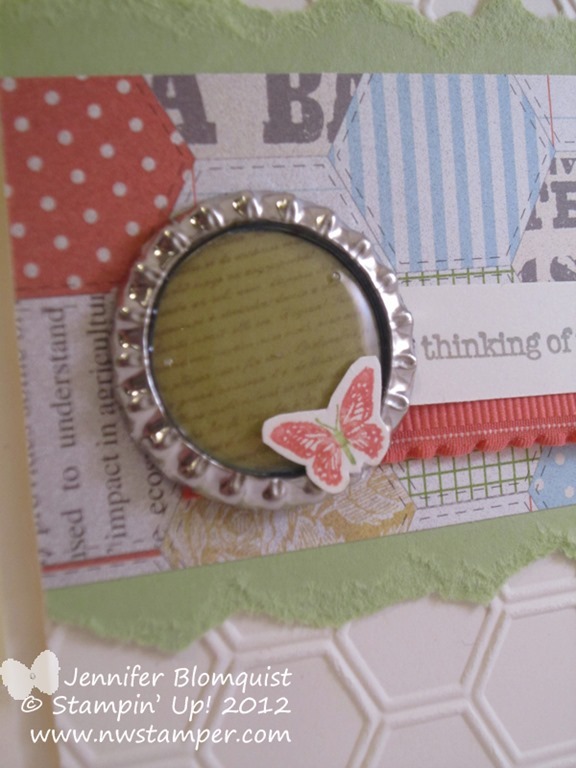 It’s Scrapbooking Sunday! I love, love, love making cards. But boy did I miss making scrapbook pages. I have photos piled up in my craft room and that is only the ones I’ve printed in the last year thinking I was going to be getting way more scrapbooking done than I did! So, I decided to play along with a sketch challenge at ScrapbookSteals and um… I think I jumped back in at a challenging time. We had to make a sunburst on our scrapbook page! I had never done that before and it was a challenge for me. But I just LOVE how it turned out! The sketch called for buttons in your sun rays but as I was playing with my buttons I realized that my “x” buttons from the Bitty Buttons set looked kind of like stitches and I was sold. 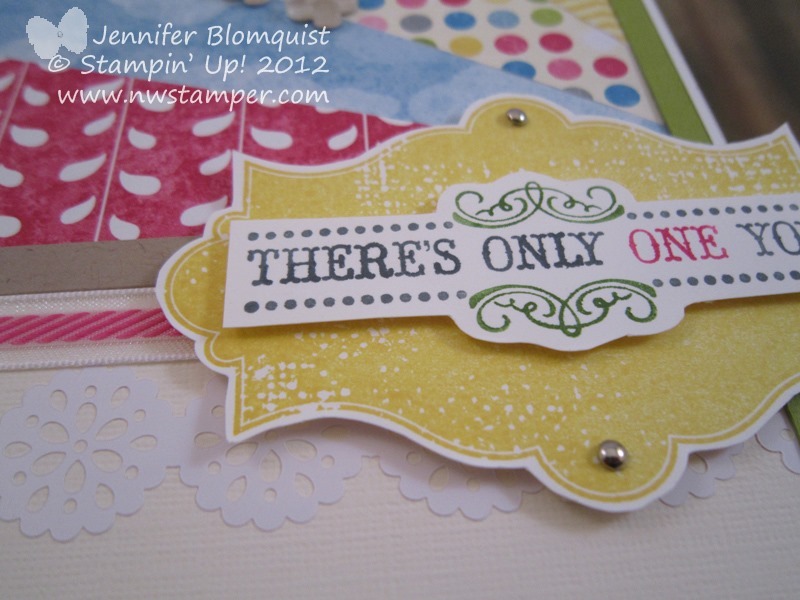 And as I tried to figure out what I would use for a title for this page, I remembered the Vintage Verses stamp set (on of the Free exclusive sets from Sale-a-Bration) and thought the “There’s Only One You” was a perfect fit. Combine that with the cool background shape from Everything Eleanor, and BAM! Title done! You can also see in that picture the Melon Mambo striped organdy ribbon (which I’m way more in love with than I thought because it is so soft and vibrant!) and the Delicate Details lace tape which I thought would be a great subtle accent for the page. Finally, I have to show you the last touch that I’m kind of proud of… the Baker’s Twine flower! I made it myself! I started with a glue dot on the page and a piece of Island Indigo Baker’s Twine. Then I formed loops and with each loop, I ran the twine back over the glue dot in the center (I had to add a second glue dot over the first to help hold it all down but it all worked out). Then to finish off the center I had a Wisteria Wonder printed brad that I covered in Crystal Effects and dipped in Dazzling Diamonds glitter. Let it dry and then set in the middle of my flower for a cute finishing touch! 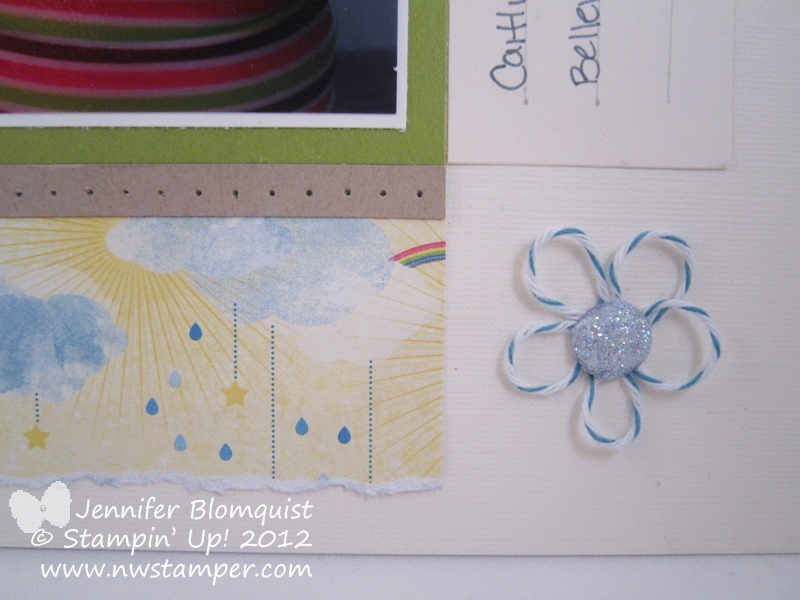 I love how this page turned out and hopefully you got some fun ideas for incorporating into your own scrapbook pages. 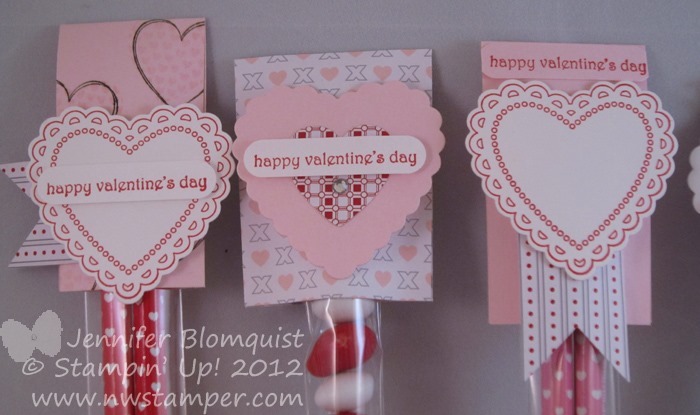 Alright, one more day of this belated-Valentine treat ideas! Today are some treat bags I put together as examples for a friend of what she could do with the Hearts a Flutter stamp set and framelits, and the 1”x8” skinny cello bags. 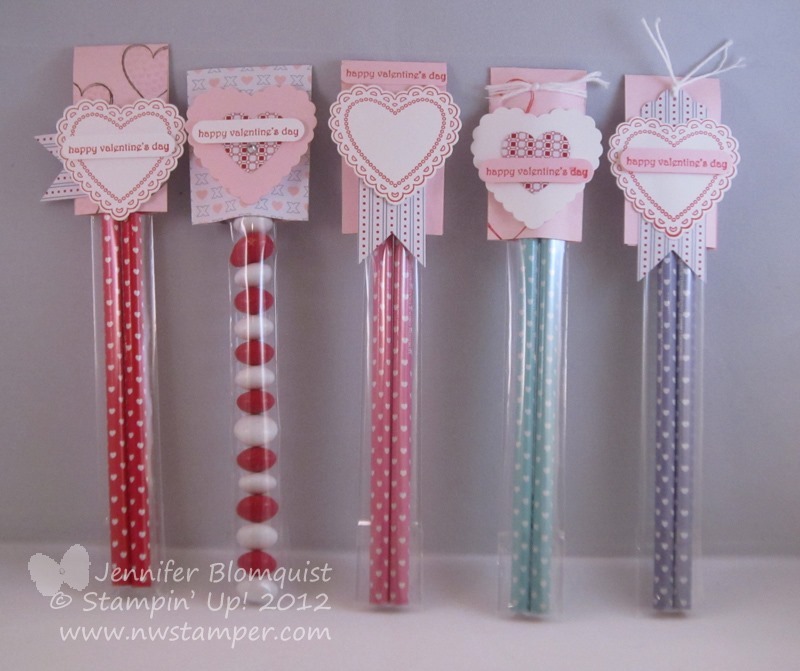 And as I was making these toppers, I found myself thinking that the Pink Pirouette cardstock that was the base was just a bit too plain, so I had to do some extra stamping of course! 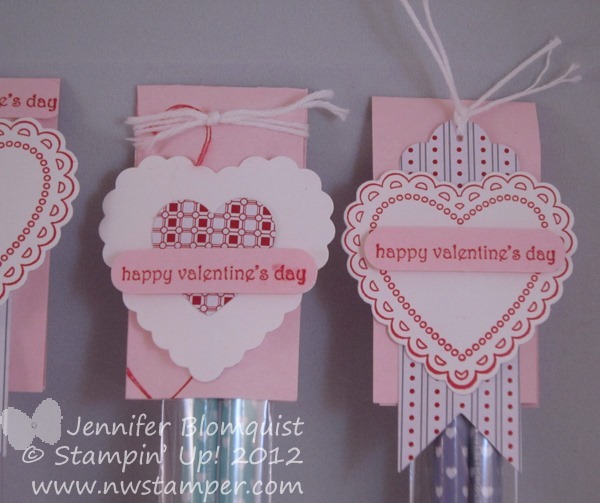 This was the project that made me discover how much I love the look of the tone-on-tone stamping of the “little hearts in a heart shape” stamp image and then randomly stamping the outline heart stamp on top in Early Espresso ink. It may be subtle but I just LOVE IT! When I am assembling these skinny cello bags, I put the opening to the bag at the bottom of the project (aka – opposite end as the treat topper). That way, if someone wants to get at the treat but not eat/use all of it, they can have some and then seal it up and not destroy the topper! So, again, change out the colors and the sentiment and you could have some cute Easter basket treat ideas!